Tarik Kazaleh shores up individual identity in the guise of Palestinian activism. Tarik Kazaleh's intense sociability has helped him in hip-hop. Anyone who knows Tarik Kazaleh as the bartender and cocktail-menu conceiver at The Layover would have a hard time believing that he was once an outcast — the kid who got beat up for being Palestinian in a Detroit Catholic school, and felt ostracized after moving in with his mom in Walnut Creek (where he was relegated to the dork crowd), or whose sense of humor was initially more of a defense mechanism than an art. Kazaleh, who is now such a visible presence in Oakland's bar scene that he could almost be deemed a figurehead, says his childhood was marked by everything but a sense of belonging. He grew up partially in San Francisco and moved about every six months after his parents divorced, attended five high schools, took the GED exam his junior year, and began the first in a slew of blue-collar jobs that would propel him into adulthood. It's perhaps no accident that he eventually found his voice in staunch, identity-affirming political activism. It was, after all, the best way for him to shore up a sense of self. These days, Kazaleh devotes about half his time to music. A longtime dabbler and collector, he has at least a passing knowledge of a full battery of instruments: moog, guitar, Arabic tabla, conga, oud, drums, piano, samplers. He provides a full orchestra on Now Here Nowhere, a new LP released under the moniker Excentrik. The album is a fascinating — if jarring — hodgepodge of world music, strident politics, and traditional hip-hop, albeit a much leaner form of hip-hop than you'd hear on contemporary radio. It certainly won't find favor with everyone, given the opinionated lyrics and the unevenness of tone. But it's an accurate portrayal of the emcee's sensibility. On his website, Kazaleh characterizes Now Here Nowhere in terms that verge on self-effacement: "angry, confused, yet driven and self-determined." He's pretty spot-on. And it only takes one listen to realize that. 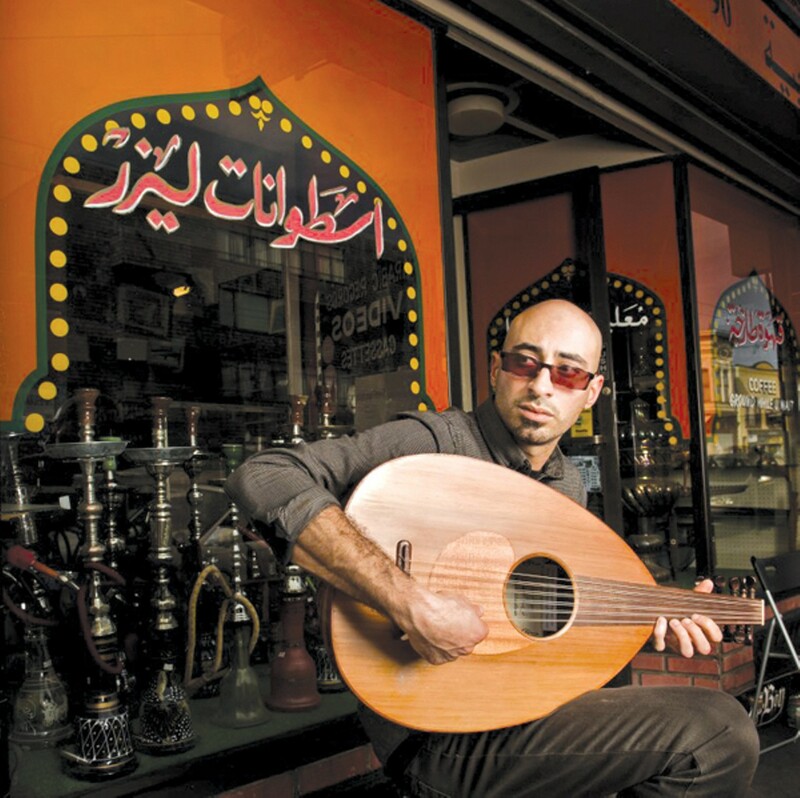 Now Here Nowhere kicks off with an instrumental track, "Loungey Arabs," that offers no indication of Kazaleh's background in hip-hop; rather, it sounds like the work of a world music artist, all narcotizing tabla and oud. It isn't until the second track that the emcee's voice comes in: You are someone living nowhere but you're at my door. It's the first mention of the album title, and the first indication of Kazaleh's personal sense of isolation. That feeling pervades the album — on "Close to the Edge," a Grandmaster Flash redux about skirmishes in the West Bank; on the acerbic title track; on the grim ballad "Somebody at My Door," which is about being ambushed and terrorized — but it's also a governing theme in Kazaleh's biography. Born in San Diego where his father was training for the US Coast Guard, Kazaleh spent most of his childhood in San Francisco and Detroit. He was a nerd, meaning he built model airplanes, painted Rocketeer illustrations, played chess, made cars from pliable plastic, taught himself guitar, and talked in a blustery way when he got nervous. "I was outgoing, but in a show-and-tell-kinda style," he remembered. "I don't think I got it, you know?" He also developed certain survival tactics as a result of having to move around so much. Kazaleh explained it in terms that could be construed as Social Darwinist: First, you make friends with people on the periphery. Then you quietly weed out the ones who are total douche bags. Then, gradually, you figure out who your real friends are. Oftentimes they're the other interlopers. In Walnut Creek, for instance, his best friends were mostly kids from other immigrant families who also liked to skateboard and listen to underground hip-hop. Kazaleh flitted between cliques and absorbed musical tastes from everyone. By the middle of high school he was listening to punk rock, death metal, emo, and atavistic Arabic music, along with hip-hop groups like Wu-Tang Clan and Boot Camp Clik. Kazaleh retained a lot of that skittish, hyper-social demeanor in adulthood. He bounced from job to job, managing restaurants, mixing drinks, clerking at health food stores, even assembling parts of Dodge Durangos. Even now, at age 31, newly married and anchored in the Oakland nightlife scene, he seems unsettled and twitchy. Hanging out at Bar Dogwood last Monday night, Kazaleh took cigarette breaks about every half hour, but never stopped talking. Sometimes he wouldn't even pause to remove the cigarette from his mouth, instead letting it bump between his upper and lower lips while he gushed excitedly about his childhood, or the time he spent a week in an Israeli jail, or the hat he wears — a Goorin Bros. 100-percent paper fedora, which, he says, always wins approval from old men on the street. There's no question that Kazaleh's intense sociability helped him in hip-hop, a genre that hinges on the proverbial gift of gab. He entered the scene in high school, recorded his first demos as a teen, booked his first show in Ypsilanti, Michigan, and partook in rap battles with emcees from the Hiero Imperium record label. He says that, at that time, he was rapping in a purely aesthetic sense, and any mention of the situation in Palestine would be general, accessible, and larded with platitudes. "I never wanted to be too geeky, politically," he explained. "It wasn't, like, 'Right to return now!' or 'Resolution 194!' It was more emotional. I didn't get cerebral until way later." "Way later" meant 2001 — right after September 11. At that time he was working at a grocery store at Haight and Fillmore streets when he started getting threats from a nearby business owner. "He called me a terrorist," Kazaleh said. "He threatened to call the FBI on me and all the other Palestinians in the neighborhood." That was enough to steer Kazaleh into activism. He joined the Arab-American Anti-Discrimination Committee in San Francisco, then signed on to the General Union of Palestinian Students at San Francisco State, then proceeded to Students for Justice in Palestine at UC Berkeley. He endeared himself to Will Youmans, a political science student and frequent contributor to the web journal Electronic Intifada, who's also a rapper — using the stage handle Iron Sheik. The two of them organized protests, jammed out on Middle Eastern instruments, and even performed an all-Arab-American hip-hop showcase at a now-defunct Oakland shisha bar called Al-Omda. Around that time, Kazaleh's lyrics got increasingly more politicized. 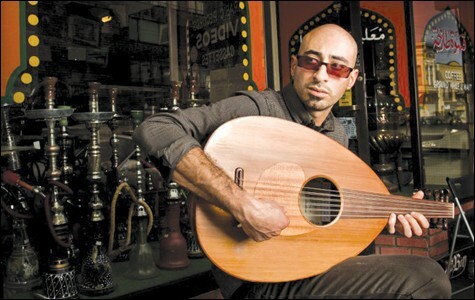 He co-founded a hip-hop crew called the Arab Summit, while playing oud for an improvised jazz trio with equally subversive intent, named The Three Mohammeds. No longer was Kazaleh rapping about Palestinian pride in a general sense; he was name-checking UN resolutions and looking for words to rhyme with "Mubarak" and "divestment." Of course, the cost of being radical is alienating a large swath of your potential audience, and that's a risk Kazaleh is apparently willing to take. 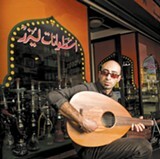 He visited Palestine for the first time in 2002 and he refers to it as "home"; the album cover for Now Here Nowhere features a collage of BART tickets and Muni transfers on the back, and a self-portrait painted on the front, with olive branches and a traditional Arabic hattah (or kaffiyeh). That duality is central to Kazaleh's art. He seems to be most comfortable dwelling in a space between cultures — an unrepentant outsider in the country where he holds citizenship; a foreigner in the land he calls home.